I just returned from the Healthcare Epidemiology Training course in Ho Chi Minh City, Vietnam, where I had a wonderful time interacting with the students and other faculty. Thanks to Professor Le Thi Anh Thu, we had the opportunity to tour an 1,800-bed hospital in the city and observed many barriers to infection control, including an average daily census greatly exceeding the bed capacity. Many patients are forced to share beds with other patients. However, in one area Vietnam is far superior to the United States; they allow alcohol hand rub at the bedside! 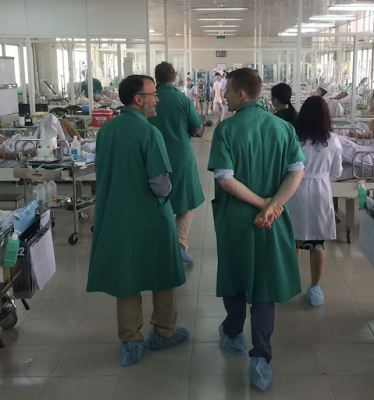 You can see Joost Hopman, Andreas Voss and I touring a medical ICU in Vietnam - notice the green hand rub dispensers at the end of the beds. In the U.S., fire code prevents alcohol hand rub from being placed at the bedside, rendering the practice of the WHO 5 moments impossible. Health care workers simply don't have the time to leave the room to practice hand hygiene after each contact with the environment or patient.